Ask the Internet and it will tell you that the only way to make Star Trek: The Next Generation better is to recast all of the roles with cats. That’s exactly what illustrator Jenny Parks has done with this new book. Indeed, Start Trek: The Next Generation Cats recalls the adventures of the U.S.S. Enterprise NCC-1701-D crew from the viewpoint of someone that has artistic talent and really enjoys a good meme. And this isn’t Jenny Parks first Star Trek cat rodeo. She also transformed the original series with the bestselling Star Trek Cats earlier this year. 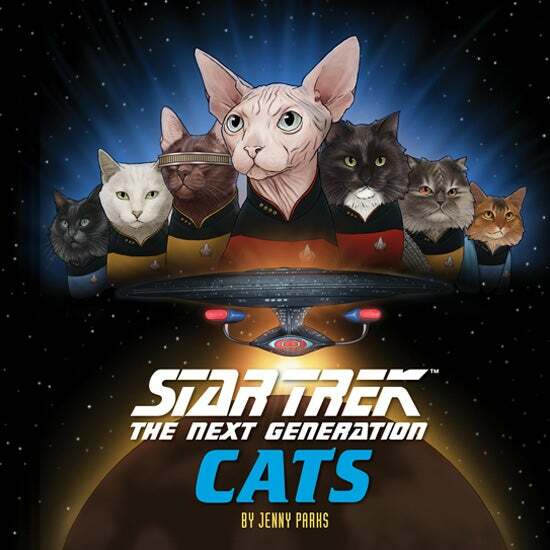 You can pre-order Star Trek: The Next Generation Cats here. The original Star Trek Cats is also on sale, if you would like to complete the set. Why wouldn’t you want both? These books are absolutely delightful and would make a fine addition to your coffee table. Like the original Star Trek Cats, The Next Generation version will feature scenes taken directly from the show. According to the official description, the book will include everything from "encounters with the Borg to adventures on the holodeck" with Captain Picard and the rest of the feline crew engaging in "lovingly detailed and eyebrow-raising scenes from throughout the award-winning series."